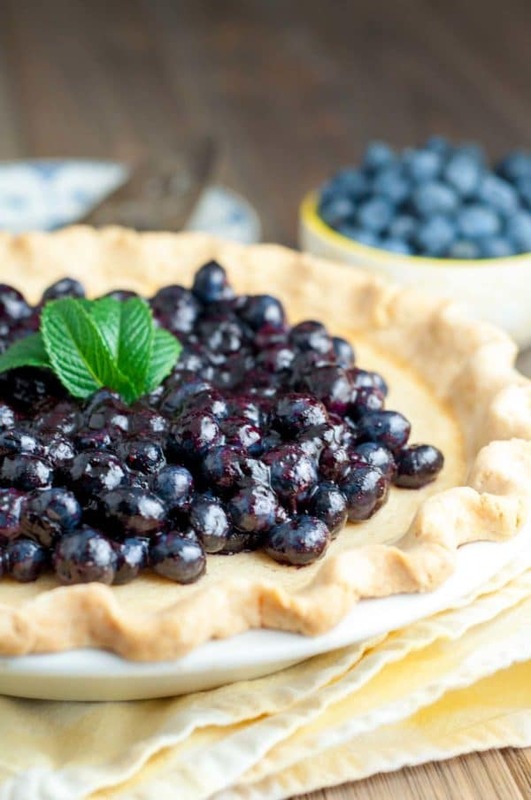 Recently my mom celebrated her 74th birthday, and I could think of no one better who would appreciate a Fresh Blueberry Buttermilk Pie than her. Plus, I had almost 25 pounds of recently picked blueberries I needed to put a dent in. During the dregs of winter I always look forward to planting my garden and going to the U-Pick orchards here in Indiana. Admittedly, a Little House on the Prairie montage may play through my head showcasing all my little ones lending a hand, harvesting our bounty, and turning it into wonderful creations. Summer finally rolls around and real life comes to fruition. There is a lot of just me in the garden planting, weeding, and picking. Then there is a lot of just me making sure it doesn’t all go to waste by canning, freezing, and cooking with our produce. Truth be told, it kind of ends up stressing me out. I stare at all that produce I’ve grown or picked and come up with too many things I have to make with it. On more than one occasion I’ve thought to myself, Why in the world did I plant 15 different types of tomatoes?! My Little House on the Prairie hopes of everyone lending a hand usually fizzles out quickly too. The kids lose inspiration and their “help” peters out. This is never how it goes down with Ma, Mary, and Laura. I don’t recall Ma raging on the girls because they’re spent after seven minutes of work. 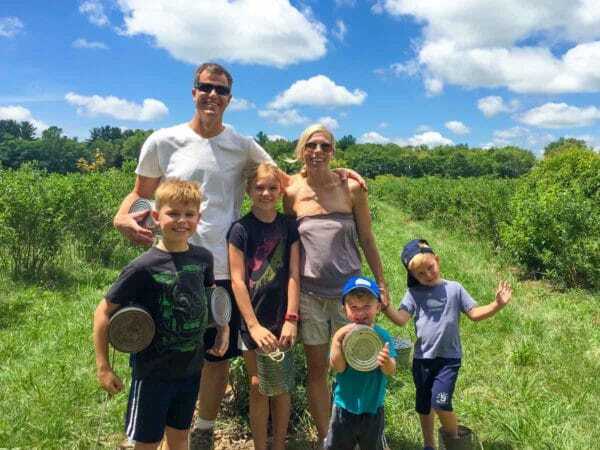 Every year it goes down like this, yet every year I continue to look forward to it, especially when we all get to go blueberry picking. I can’t help to get excited about all the blueberries we are going to score as a family team. My husband, myself, and four kids…we’re going to kill it! Then it goes down a little like so… Great excitement on the tractor ride out to the field, whole-hearted enthusiasm picking the first 30 berries, and then an abrupt shift, crash, and burn. They get very side-tracked by the nearby cooler with drinks and snacks, which is subsequently followed up by a lot of dramatic, lethargic pleas to leave. I, in turn, start to get irritated about their lack of production and demand they can’t leave until they’ve reach their quota. On this particular trip, Elliot, my 2 year-old, took my advantage of my distracted exasperation to find the ten gallon buckets of berries we had just picked and DUMPED THEM ON THE GROUND. I did not react they way Ma Ingalls would have. Ryan must have sensed me about to come unhinged because he escorted me away from the crime scene and underwent blueberry recon on his own. Evidently Elliot was really tore up about the whole ordeal because I kept hearing him excitedly yell, “Hi Daddy!” from his timeout station under the blueberry bush. Despite the blueberry tipping debacle and a wee bit of whining, we did enjoy a beautiful day. 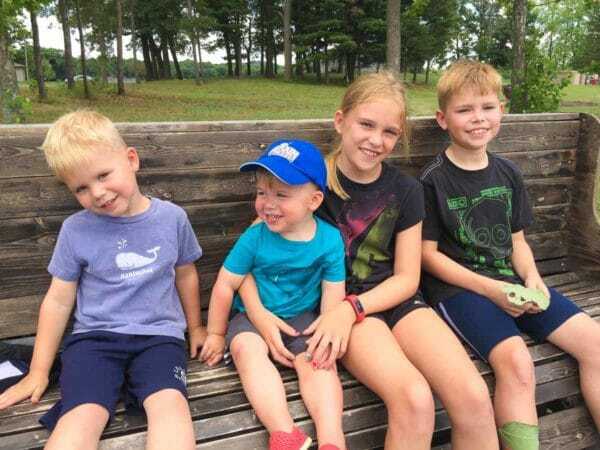 It was probably the most comfortable weather I’ve ever picked in (Hoosiers normally get to enjoy a lot of sweltering humidity during the summer), and the kids did throughly enjoy their five minutes of picking. It might not have transpired as I hoped, but I will continue to bring my kids fruit picking. When they are older they won’t remember me yelling at them to keep production up (fingers crossed), or being hot and miserable. Hopefully they will just remember all of us there together, eating their weight in fruit, and all the delicious food we get to eat afterwards. 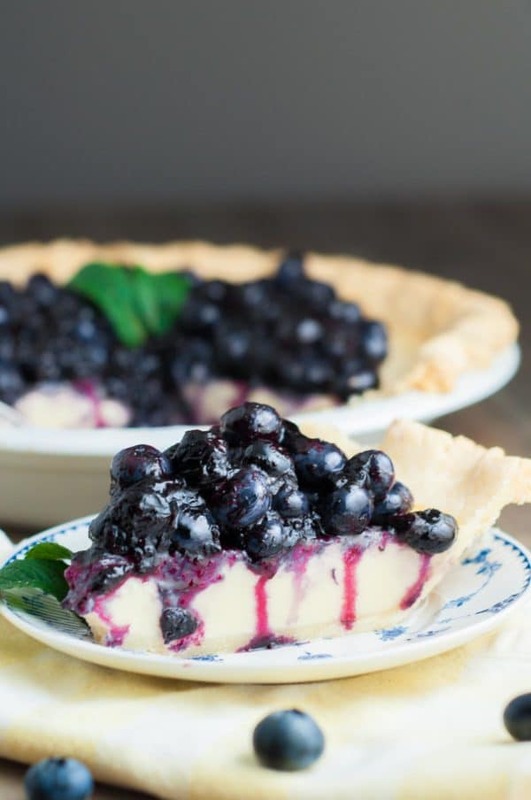 Fresh Blueberry Buttermilk Pie combines the creamy, sweet, tanginess of a buttermilk filling with a fresh blueberry topping. Heat oven to 325ºF. In a small bowl whisk together flour, sugar, and salt. Set aside. In a large bowl whisk together the eggs with the egg white. Add the condensed milk, buttermilk, lemon juice, and vanilla, whisking throughly. Whisk in reserved flour / sugar mixture. Pour into pie shell. Bake for about 50 minutes or until filling sets. Transfer to a rack to cool for at least 20 minutes until lukewarm. In a small sauce pan stir 1 cup blueberries on low heat until they start to become juice, about 2 minutes. Add sugar and stir until dissolved. Increase heat to medium and let blueberries simmer, stirring occasionally, until thickened, about 4 minutes. Remove from heat and stir in vanilla. Let cool down about 10 minutes and then add remaining fresh blueberries. Spread blueberry mixture over top of pie. Serve warm or cool completely. Store leftovers in refrigerator.